We're excited to introduce the new Klipfolio® interface. This new interface includes improved icons, left-side navigation, and the ability to switch between Custom Dashboards (Klips™) and Metric Monitoring (metrics). This article explains everything you need to know about Klipfolio's new homepage. 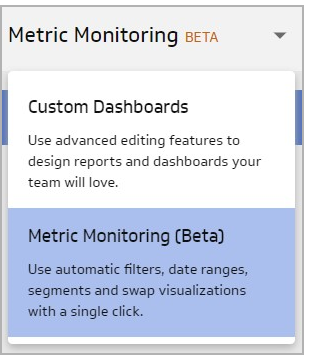 Use the drop-down toggle on the left-side navigation to change the display of your homepage between Custom Dashboards and Metric Monitoring (Beta). Learn more about metrics. Select Metric Monitoring (Beta) to view all the metrics in your account. Use the + icon beside Metrics to add a custom or pre-built metric. Metric Boards are used to display a set of related metrics. Use the + icon beside Metric Boards to start adding Klipboards. Select Data Sources to view a list of all your data sources. Metrics can only be built with modelled data sources. Use the shopping cart to get to the pricing plan page in one click, enabling you to change your plan at any time. Use the question mark icon to access an introductory Metrics (BETA) Knowledge Base article. Use the paint palette icon to switch your side navigation bar between the slate, light, and dark themes.